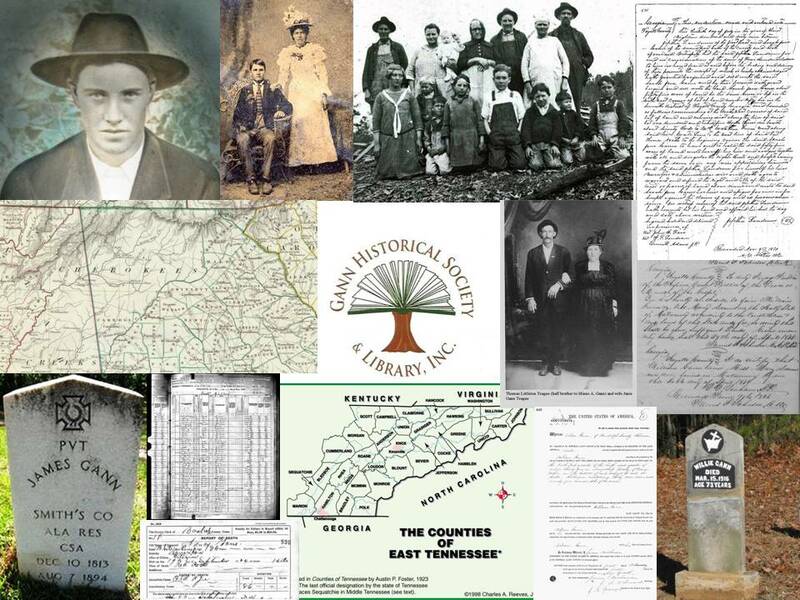 The Gann Historical Society & Library, Inc. is a tax exempt non-profit 501(c)(3) organization dedicated to promoting an interest in family and community history through its programs of education, preservation, and exchange. Tom Gann of Lufkin, a true “rut nut” in his own right, has invited me to be part of the 2019 national meeting held in Texas for their theme “Gone to Texas.” These national gatherings feature lectures, workshops and seminars on the sources and methods of research, and various aspects of genealogy. For more information go to http://gannhistoricalsociety.com/. I will be there presenting on Trammel’s Trace. The museum book store will be selling books. For more information go to www.thestoryoftexas.com. This group is one of the most active in the region and always includes people with vast knowledge about the history of the people of East Texas. 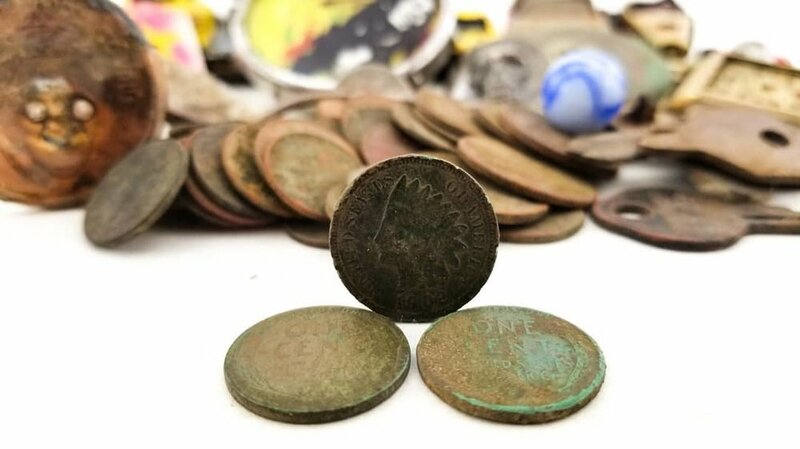 The focus will be on Trammel’s Trace, but I’ll also cover a bit about the Hendricks Lake treasure legend and the people involved in efforts to recover the legendary silver cache. For more information, contact Rick Featherston, President at president@etgs.org, or Scott Fitzgerald at scottfitzgerald@tyler.net. You can also find more at their Facebook page. Thanks to an invitation from Trevia Wooster Beverly, I get to do a somewhat local presentation in Baytown in the shadow of the San Jacinto monument. Due to limited seating, reservations are highly recommended by leaving a phone message at 281.421.2099 (state your name, number attending, and phone number in case they need to contact you) or via email to info@baytownhistory.org. Social is at 9:30 am, program begins at 10:00. For more information contact the BHPA by email at info@baytownhistory.org or call 281-421-2099. Learn more about them at www.baytownhistory.org. FINALLY able to make my way up to the best part of Texas again to speak to this group. I’ve been wanting to get mid-week time to do this for a while. We will be discussing Trammel’s Trace but I won’t miss an opportunity to talk Hendricks Lake treasure with all these expert detectorists. Books will be available for purchase for $25. For more information contact Michael Heim at preaherdigger49@gmail.com. The Lone Star Chapter of SRT is an active group involved in historical and educational presentations in their communities. It will be an honor for me to present the story of Trammel’s Trace to folks so intimately involved with the early immigration to Texas. Books will be available for purchase for $25. For more information, contact Marshall Brown at Marshall@MBrownLLC.com. Jeff Wheat, 7th grade teacher at Greenville Middle School, has worked out a plan for me to present to about 110 students of Texas History. I know I’m gonna have fun with this, and I sure hope they do as well. Tough audience, but my wife says i’m well equipped for this group. Was that a compliment???? Jeff, if this works out well, do you think you could send a letter to my former “junior high” and suggest they give me extra credit on my own grades for 7th grade Texas History? So pleased to be able to make it up to the “northern tier” on this trip and present to the group in Sulphur Springs. 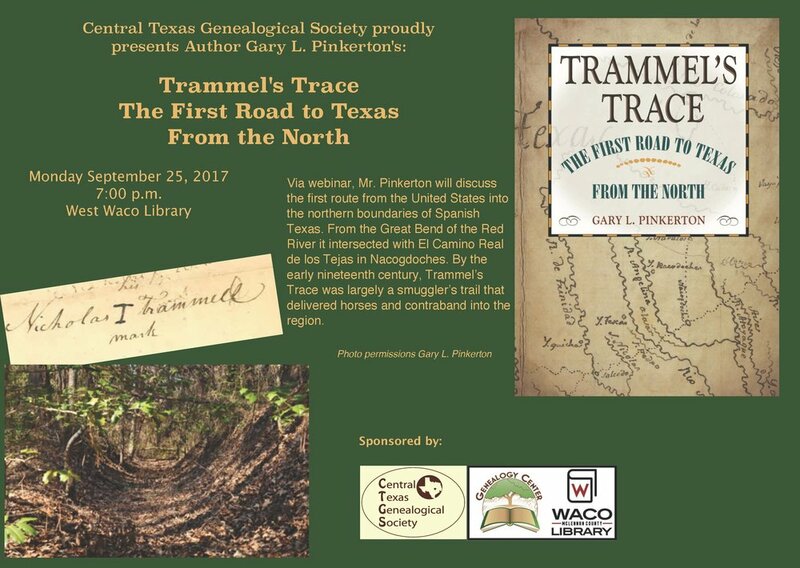 Will be telling the story of Trammel’s Trace and the importance of its role in early Anglo migration into Texas. For more information contact Rhonda Bechhold by email at rhondabec2@gmail.com. The folks of Lamar County know their history so it will be a real treat to introduce them to Trammel’s Trace and the connections to the earliest history of immigration to Texas from the north. It’s been a while since I have been back, but I did my social work internship at the hospital there as a student of ETSU, so looking forward to it. For more information contact Linda Broyles at purplel2000@yahoo.com or genlibrary@lamarcountytx.org. I finally get a chance to make it back way up to Clarksville and Red River County! This is where Anglo Texas really began with the earliest settlers at Pecan Point, mostly Tennesseans. Very much looking forward to this one. For more information, contact Johnnie Lee at johnie_lee@hotmail.com. This library and museum in Woodville located in the historic Robert A. Cruse house is a centerpiece of the Tyler County community and recognized by the Temple Foundation as “the benchmark” for all other Texas libraries. Tyler County historians are active through the Gov Shivers Museum and Library, the Tyler County Historical Commission, The Tyler County Forest Landowners Association and the Heritage Village Museum. This invitation to Woodville will get me back over to the part of Texas where I spent many years (Jefferson & Hardin County). Looking forward to this event and I invite those from SE Texas to join us. Meet and greet (to include refreshments) at 1 pm, presentation and book signing to follow. There's no discussion needed - this is our favorite book event of the year. This is our third year and the first place books were offered. We are surrounded by food, in the midst of living history events, and visited by East Texans who want to know their history. Throw in a mule pressing sugar cane, the storytellers across from our booth, and a funnel cake and you have yourself a mighty fine Saturday in early Fall. We'll be right outside the door from the museum to the grounds in our usual spot. Maps to give away, plenty of books for you and 10 of your closest friends, and maybe something new for this year. This year marks the 225th anniversary of the birth of Stephen F. Austin. The local community has celebrated this event at the historic site of San Felipe de Austin for over 90 years. With a new museum open on the grounds, the Texas Historical Commission will host an exciting history festival that will include guest speakers (like me), themed tours, a variety of hands-on programming experiences, living history programs and demonstrations, period music and much more. I will be selling and signing Trammel's Trace books all day, with presentations at 10:30 am and 2:00 pm. For more information, contact the museum at 979.885.2181. Caddo Mounds State Historic Site will be holding its annual El Camino Real de los Tejas (ECR) Festival at the end of October. Mickey and I will be there to sell books and I'll be doing a presentation on Trammel's Trace at 10:30. Remains of the El Camino Real on the grounds of Caddo Mounds State Historic Site. The ECR Festival focuses on making history come to life. Travel back in time on the historic El Camino Real De Los Tejas! Enjoy food, fun, pioneer skills, presentations, crafts, music, and guided hikes. There will also be "Lost Skills" programs on foraging, friction fire, flint knapping, grass house presentations, and more. The event is free, but donations will be accepted by the Friends of Caddo Mounds. What better way to spend a beautiful Fall morning? For more information call 936.858.3218. Other than the publication of my book on Trammel's Trace, this is the most significant event on this journey into Texas history. The Stone Fort Chapter of the Daughters of the Republic of Texas in Nacogdoches have undertaken an effort to plan, fund, and erect a 5-foot tall black granite marker memorializing the role of Trammel's Trace in early Texas history. A bronze DRT medallion will be part of the 5-foot tall black granite Trammel's Trace marker. This stunning marker will interpret Trammel's Trace and its importance, display the map of the early route, and proudly display a DRT historical marker. The location for the marker will be along Banita Creek where the early road from the north likely intersected the San Antonio Road. Plans are still being finalized for this significant event. The location is at the south end of Banita Creek Park, near the Farmer's Market, at the intersection of Pearl and Hospital streets. Consider this your official invitation to attend. The theme for the 127th Annual Convention of the Daughters of the Republic of Texas is "Pathway to Texas." I am very thankful for the opportunity to speak to the group about Trammel's Trace and its role in delivering many of their ancestors to the Republic. I will be doing a workshop session from 1:15 - 2:00 pm on Thursday, May 17th, after which I will have books for sale and signing. Then during the reception that evening I have the wonderful opportunity to take the audience for a 10-minute trip along the road that many of their ancestors took to Texas. Accounts of the rivers, swamps, critters, storms, floods, and interesting characters will be part of the tale. Many thanks to Susan Aikin for the invitation. Presentation and book signing for weekly meeting of the Marshall (TX) Rotary Club. Additional information on work in the field in Harrison County to locate remaining swales of Trammel's Trace. Presentation for the board of directors meeting for the Foundation, held in South Padre. Thanks to Gene Krane and Bruce Elsom for the invitation. If you have not yet visited Caddo Mounds State Historic Site and seen their beautiful new visitor center and the amazing grass house, now you have TWO reasons to come. I will be presenting "Trammel's Trace: East Texas' First Road" on Saturday, December 9th. Along with an overview of the Trace and the man for which it is named, Nicholas Trammell, I'll explain how many of those who used the road also crossed along the El Camino Real just behind the mounds. Books will be available for sale and for signing, and I will stick around to talk history with anyone interested. Come early to explore the mounds, see the new visitor center, and experience the grass house. You will be amazed. See you there! For a full meeting program and to register, go to https://etha.wildapricot.org/Fall-Meeting. Will be presenting a program for the library's Adult Learning series. For more information contact Cheryl Loewen, Reference Librarian, at 409.643.5974. Looking forward to a first in my presentations on Trammel's Trace; the use of GoTo Meeting to present in Waco from home here in Houston. For those of you in the Waco area, contact Gina Andrie at 254-379-3302 for more information, for go to their website at www.ctgs.org. Dr. Jim Harris of Marshall will host a talk before a group of community leaders in Marshall, Texas. Monday luncheon meeting. Will present the story of Trammel's Trace for a group with extensive, personal knowledge about the history of Texas for their own ancestors. If you are not a member and are interested in attending, contact Bart Dawson at 281.220.7321 for more information.